We would like to take this opportunity to familiarize you with the professional and personalized care available to you, both in our offices and in our hospitals. Please take a moment to review the information in this website. A friendly staff is only a phone call away to answer any question that you may have. A doctor/patient relationship must include a mutual trust and confidence in order to obtain a satisfactory outcome. We at Pasco Cardiology Center want you to be completely comfortable and informed regarding your condition and treatment. Therefore, we encourage you to ask questions and bring family members with you. 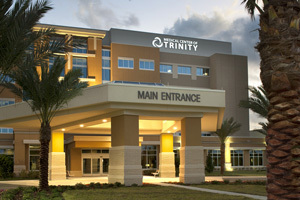 The physicians of Pasco Cardiology are on staff at Regional Medical Center Bayonet Point, Medical Center of Trinity, and North Bay Hospital. If you have an emergency please call 911 or go to the nearest hospital. For less urgent problems, please call us at 727-868-5404 or 800-337-5404 and the doctor will be in touch with you, either directly or through the staff, giving you instructions. Trained personnel are available for any assistance you may need. We also have patient educational material available on diet, medicine, cardiac procedures and many other health topics. All Prescriptions and renewals should be requested during normal office hours at 727-372-5952 or 727-868-5404, please have your pharmacy name and telephone number handy. We trust this website answers any questions that you have. However, please contact us if you need further clarification. We welcome suggestions that you may have about our office or services. We will continuously make the necessary changes to provide you with the best medical care possible. If you are a winter resident, we will be happy to work with your doctor during your stay here. We are pleased to announce that we are now able to offer venous ablation of the legs for our patients who are suffering from venous disease. This is an exciting technology designed to help patients who have symptoms of venous insufficiency. If you have swelling of the legs after prolonged standing, burning/cramping of the legs, restless legs, varicose veins, increasing urinary frequency at night, color changes in the skin of your legs, or leg ulcers, please discuss this with us at your next appointment, or contact our office to make an appointment.